As we planned, the ommaya (brain port) was placed May 1. Everything went off without a hitch then we were off to New York within the week. I will not dare to bore you with the details from May through August. 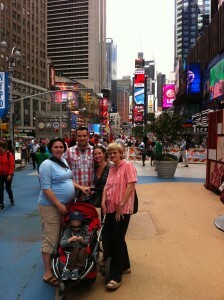 We came and went frequently to the Big Apple. 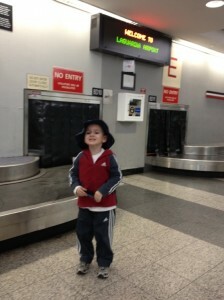 LaGuardia Airport and its snack spots were too familiar to Liam. We were blessed with safe uneventful travel. If our flights were delayed it was only just long enough to eat a proper breakfast. Truly we had no complaints, even traveling 9 months pregnant we had zero issues. Our stay in New York was great, during the week we would stay at the Ronald McDonald House of Manhattan and on the weekends Terry & Tony Cullinan(my cousin) welcomed us with open arms. It was amazing to have a real home full of normal goings on and wonderful meals. We could really forget about the hospital stuff. It was such good medicine to be away from the the city. Liam especially loved heading to Terry’s, he made himself at home very quickly and in so many ways. He had his own room that he could retreat to when tired, there is no pressure but to be ourselves, it is home away from home. I wish there was a way to properly thank Terry, Tony and whole family for allowing us to invade through the whole summer, it was priceless. The treatments had there up’s and down’s. I am grateful for the research and treatments done at MSKCC they are on an island of their own on the forefront of cancer treatments. There were lots of fear and frustrations but at the same time we found laughter, excitement and joy. We try to make the best of any situation. We are happy to be in the game, there are so many kids that don’t make it off the bench. Liam is an amazing little guy, I’m sure you have picked up on that over the years. 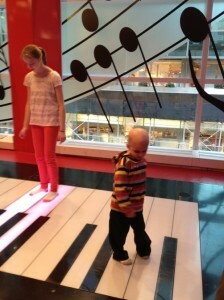 You wouldn’t believe how this 4 year old can be so tolerant and adaptive to treatment issues. We were thrilled to realize the brain radiation injection treatment only had 2 cycles. I was absolutely certain we had 3 to complete but I was absolutely wrong. That was such a gift from God. It was plain scary for Liam to have frequent needle pokes to the ommaya(on his head) Thankfully he felt little effects from the injections. Honestly the toughest part was being separated from Liam for a week. As a pregnant woman it would have been dangerous to the babe for me to have contact with Liam. We followed the rules very seriously and Liam seemed to understand and tolerate my “allergies.” He was none the wiser that the babe had anything to do with our separation. Summer in New York was fun. There is always something new to explore. It was really special to have all the time together as a family. Liam speaks of New York fondly and I think it’s partly because he was with some of his favorite people all the time. Daddy worked only at night after Liam was snoozing it was a dream come true. It really made the yucky times easier to have fun together. The reprieves with family we had out to the near and far suburbs of New York really made this terrifying summer something to look back on with very fond memories. Whether we were swimming or barbecuing we had fantastic distractions. Liam even has a Yonkers library card!